Our Abpromise guarantee covers the use of ab59020 in the following tested applications. WB Use a concentration of 0.01 - 0.03 µg/ml. 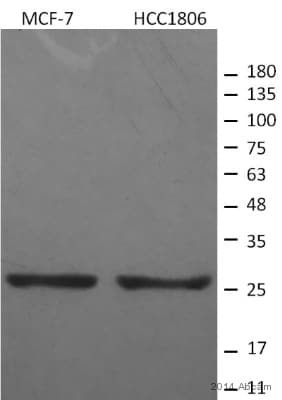 Detects a band of approximately 26 kDa (predicted molecular weight: 26 kDa).Can be blocked with GJB2 peptide (ab238354). Defects in GJB2 are the cause of deafness autosomal recessive type 1A (DFNB1A) [MIM:220290]. DFNB1A is a form of sensorineural hearing loss. Sensorineural deafness results from damage to the neural receptors of the inner ear, the nerve pathways to the brain, or the area of the brain that receives sound information. Defects in GJB2 are the cause of deafness autosomal dominant type 3A (DFNA3A) [MIM:601544]. Defects in GJB2 are a cause of Vohwinkel syndrome (VS) [MIM:124500]. VS is an autosomal dominant disease characterized by hyperkeratosis, constriction on finger and toes and congenital deafness. Defects in GJB2 are a cause of palmoplantar keratoderma with deafness (PPKDFN) [MIM:148350]. PPKDFN is an autosomal dominant disorder characterized by the association of palmoplantar hyperkeratosis with progressive, bilateral, high-frequency, sensorineural deafness. Defects in GJB2 are a cause of keratitis-ichthyosis-deafness syndrome (KID syndrome) [MIM:148210]; an autosomal dominant form of ectodermal dysplasia. Ectodermal dysplasias (EDs) constitute a heterogeneous group of developmental disorders affecting tissues of ectodermal origin. EDs are characterized by abnormal development of two or more ectodermal structures such as hair, teeth, nails and sweat glands, with or without any additional clinical sign. Each combination of clinical features represents a different type of ectodermal dysplasia. KID syndrome is characterized by the association of hyperkeratotic skin lesions with vascularizing keratitis and profound sensorineural hearing loss. Clinical features include deafness, ichthyosis, photobia, absent or decreased eyebrows, sparse or absent scalp hair, decreased sweating and dysplastic finger and toenails. Defects in GJB2 are the cause of Bart-Pumphrey syndrome (BPS) [MIM:149200]. BPS is an autosomal dominant disorder characterized by sensorineural hearing loss, palmoplantar keratoderma, knuckle pads, and leukonychia, It shows considerable phenotypic variability. Defects in GJB2 are the cause of ichthyosis hystrix-like with deafness syndrome (HID syndrome) [MIM:602540]. HID syndrome is an autosomal-dominant inherited keratinizing disorder characterized by sensorineural deafness and spiky hyperkeratosis affecting the entire skin. HID syndrome is considered to differ from the similar KID syndrome in the extent and time of occurrence of skin symptoms and the severity of the associated keratitis. Blocked with 5% milk for 1 hour at 25°C. Publishing research using ab59020? Please let us know so that we can cite the reference in this datasheet. Thank you for contacting us with your question. We would recommend starting with 5 ug/mL in IF, which would be a 1:100 dilution, though this concentration will need to be intrinsically optimized for your samples. I hope this information is helpful, but please let me know if you have any further questions or if there is anything else you need.